It is now being claimed over-75s are missing out on the flu jab in Grampian. Health bosses have urged vulnerable people to protect themselves from a deadly flu outbreak sweeping the country as figures revealed that almost 120,000 “at-risk” individuals have not been vaccinated across the north and north-east. 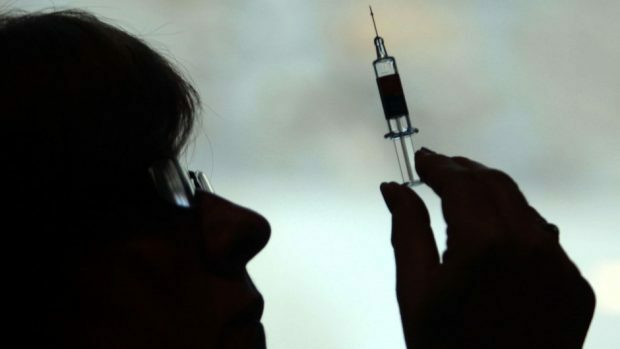 More than 53,000 pensioners are yet to receive the potentially life-saving jab across the NHS Highland and NHS Grampian areas, where the virus has affected soaring numbers and claimed the life of a healthy Wester Ross teenager. And about 65,000 younger patients classed as especially vulnerable also remain more liable than they need be to catching the virus. NHS chiefs yesterday urged those eligible for the free vaccine to act now, stressing that some strains of the illness “can be fatal”. Figures obtained by the Press and Journal show that 30,939 over-65s in the NHS Grampian area have not been vaccinated, along with almost 41,866 younger people younger designated “at risk”. In the NHS Highland area, 22,891 pensioners have not been vaccinated and another 23,260 in the younger category. The figures emerged just days after the death of teenager Bethany Walker. The 18-year-old, who lived in Applecross, was airlifted to Raigmore Hospital when her flu symptoms developed into bacterial pneumonia and sepsis. Her heartbroken mum said the teenager died “despite the best possible treatment” from medics in Inverness. Consultant in public health medicine with NHS Grampian, Emmanuel Okpo, yesterday issued a plea for more people to protect themselves from the bug. He said: “It is well known that older people, children, pregnant women and those who have other health conditions are more likely to experience complications as a result of influenza. “It can result in hospitalisation or, in the most serious of cases, can be fatal. The fresh statistics show that 50,244 pensioners in the NHS Highland area have been vaccinated, which is 68.7% of those recommended to receive the jab. But that represents a decline from 69.8% the previous year and 72.9% over the 2015/16 winter. Meanwhile, 16,868 people also regarded as at heightened risk have been vaccinated, which is 41.6% of those doctors believe need the protection. That represents a drop from 43.9% the previous year and 45.4% in 2015/16, a situation branded “concerning” by shadow health minister and north MSP David Stewart. In NHS Grampian, 71% of pensioners have been vaccinated, which is an increase from 70.4% last year. But only 40.7% of younger people at risk have received the treatment, which is down from 41.3% last year. The Patient Action Coordination Team, an independent group of NHS Grampian patients, believes more people should make the effort to get vaccinated. Jamie Weir, a retired NHS Grampian board member and spokesman for the patient group, said: “Flu vaccination is well promoted by all health professionals but the take-up is up to the individual. “Over the last few years, the accessibility to vaccination has improved but it still requires patient motivation. Moray MSP, Richard Lochhead, visited Elgin’s Dr Gray’s Hospital yesterday to see how staff had been coping with the outbreak. A spokeswoman for NHS Orkney said that 46.9% of people classed as eligible for the flu vaccination have been vaccinated, leaving 1,241 eligible people who have not yet taken the opportunity. An NHS Western Isles spokeswoman said the local flu vaccination uptake was 62.7% for pensioners and 43.7% for those deemed “at risk”.